I bought a new travel mug, because let’s be honest, having my coffee / tea be lukewarm after only 1,5 hours is no fun, and that’s what happened with my old one. It was a cheap one, so I guess I can’t really complain about that. But you see, I take the mug along when I have a 1 hour commute, and I like to enjoy my hot beverage during at the very least the whole first class of the day, and preferably longer than that. So as I said, I bought a new travel mug. I purchased a Contigo Aria AutoSeal 470 ml. A tad bigger than my old one, but hey, coffee addicts rejoice. Notice how I also did not get the 600 ml one? I know my limits. I bought it from Cool Blue (more precisely, their theepotstore) for a mere 30€ including free next day shipping. And today around 11am it was delivered to my door. Yep, it’s purple. 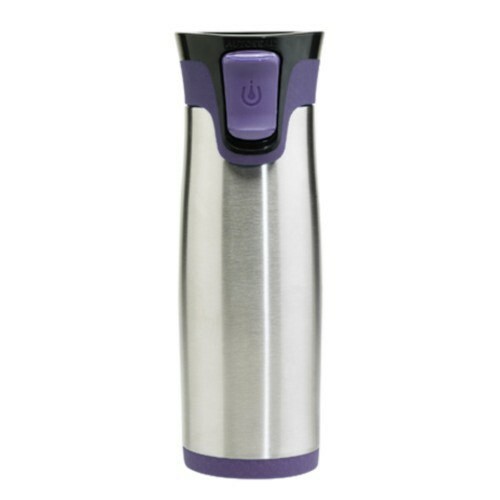 While Contigo does make it in other colors, it seems like most stores only carry the purple one. Not my most favourite color, but I don’t hate it. So what’s a future engineer to do upon getting a new thermos mug? Test it out. I took out my candy thermometer, boiled some water, and took some measurements. 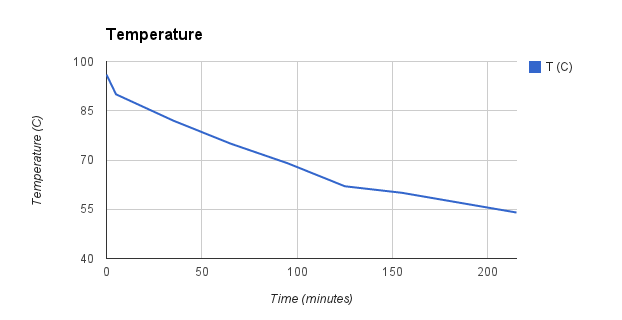 Boiling water just poured measured at 96°C (which means I should calibrate the thermometer, but was too lazy to do it today and will take the 4 degree error as systematic and completely ignore it. Because I can). So I then measured after 5 minutes without the lid (about how long it takes for tea to brew) and put the lid on. I measured again at 30 minutes intervals and got to 7 measurements before I got bored. Results are that after 3,5 hours, the water is at 54°C, which is still nicely drinkable. Of course, I did not pre-warm the travel mug before making this totally unscientific experiment. Should I pre-warm it, I expect the drink would stay warm(er) long(er), and probably up to the 5 hours Contigo states this mug keeps warm. As for the 100% leak free? I simply upturned the mug (over the kitchen sink, I’m not that crazy), and yep, absolutely no leak. The lock mechanism works nicely, and you can indeed use it with one hand. Really handy when you’re busy taking notes. The real test comes next week, when I’ll be taking it to school. Disclaimer: I am in no way affiliated with either Contigo nor Cool Blue. No one has paid me to run this test and write the review. I don’t get any cash if you click those links.